This fascinating and complicated little cluster of cornulitid wormtubes was found by my current Independent Study student William Harrison while we were doing fieldwork near Petersburg, Kentucky. (Just down the road from the infamous Creation Museum, ironically.) It was collected from a roadcut in the Bellevue Member of the Grant Lake Formation (Upper Ordovician, locality C/W-152). We’ve seen all the elements before (cornulitids, bryozoans and stromatoporoids), but not in such a tight set of relationships. I find this aspect of paleontology to be one of the most delightful: who lived with whom and how? The tubes are of the common Paleozoic genus Cornulites Schlotheim 1820, and the species is Cornulites flexuosus (Hall 1847). These long-extinct little marine animals had calcitic shells and likely bore a filter-feeding lophophore, as shown in the reconstruction above by my friend Olev Vinn. They appear to be related to brachiopods, bryozoans, phoronids, and some other tubeworms that shared this feeding device and certain features of the shell. Their life goal was to keep their lophophore or equivalent apparatus free of obstructions so they could collect nutrients from the surrounding seawater. 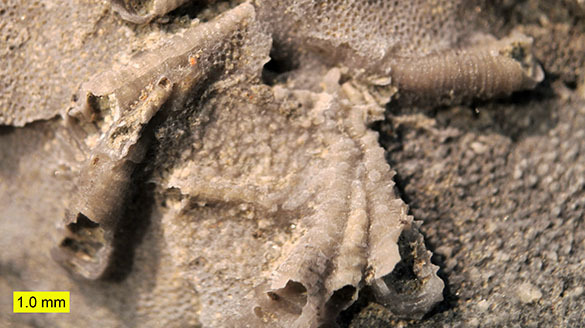 The bryozoan, which makes up the primary substrate of the specimen (seen above) is a trepostome. Its skeleton contains hundreds of tiny tubes (zooecia) that held individuals (zooids) in the colony (zoarium — these terms are for my paleo students this week!). 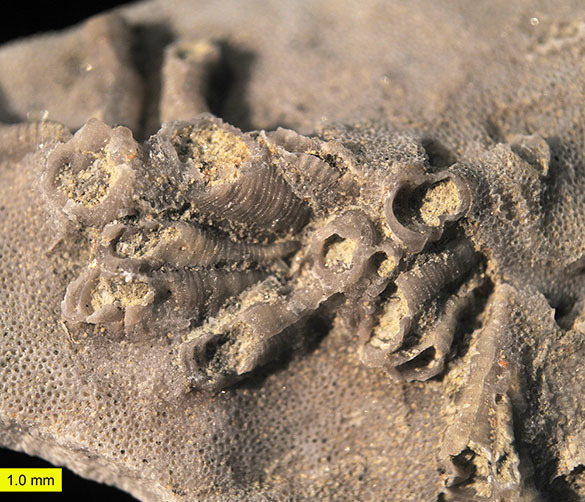 Each zooid in this type of bryozoan had a lophophore for filter-feeding. Above we see a thin, light-colored, bumpy sheet in the center of the image covering three of the cornulitid tubes and some of the bryozoan. This is the stromatoproid Dermatostroma papillatum (James, 1878). 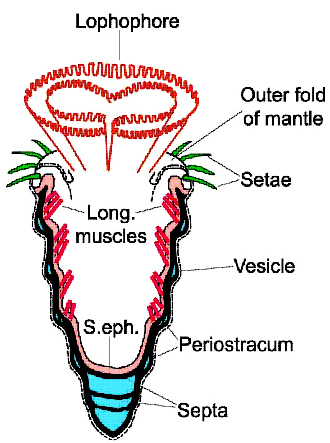 Stromatoporoids were a kind of sponge with a skeletal base, so this organism was also a filter-feeder. (It was originally known as Stromatopora papillata James, 1878.) Here we see the interesting symbioses (living together) aspects of this tiny assemblage. In the top right you see a cornulitid tube growing over the bryozoan, but the bryozoan in turn is overgrowing its proximal parts. The bryozoan and the cornulitid were thus alive at the same time. The stromatoporoid is growing over the bryozoan and the three cornulitids, but it is overgrown by cornulitids on the left. In addition, the stromatoporoid did not obstruct the cornulitid apertures, an indication that they were occupying living tubeworms. My hypothesis, then, is that all three of these characters were alive at the same time growing in response to each other. It could be that this represents a tiny hard substrate tiered assemblage, meaning that the organisms were selecting food resources at slightly different heights and particle sizes (see Ausich and Bottjer, 1982, for a start on the tiering literature). The cornulitids may have taken the largest bits, the bryozoans the next size, and then the stromatoporoids, as minuscule sponges, got the finest particles. This is another paleontological hypothesis that can be tested with further specimens. It is also an example of the value of getting sharp-eyed students on the outcrops as often as possible. Good work, William! Ausich, W.I. and Bottjer, D.J. 1982. Tiering in suspension feeding communities on soft substrata throughout the Phanerozoic. Science 216: 173-174. Galloway, J.J. and St. Jean, J., Jr. 1961. Ordovician Stromatoporoidea of North America. Bulletins of American Paleontology 43: 1-102. Morris, W. R. and H. B. Rollins. 1971. 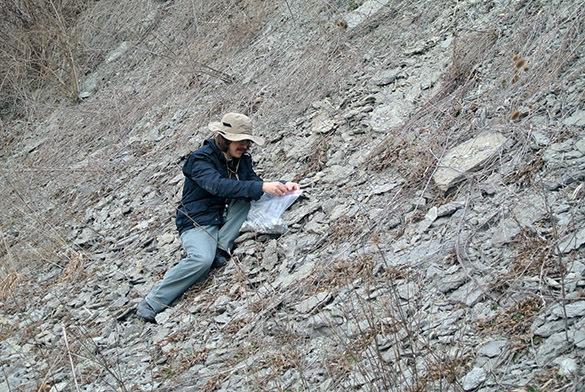 The distribution and paleoecological interpretation of Cornulites in the Waynesville Formation (Upper Ordovician) of southern Ohio. The Ohio Journal of Science 71: 159-170. Parks, W.A. 1910. Ordovician stromatoporoids of America. University of Toronto Studies, Geology Series 7, 52 pp. Schlotheim, E.F. von. 1820. Die Petrefakten-Kunde auf ihrem jetzigen Standpunkte durch die Beshreibung seiner Sammlung versteinerter und fossiler Ueberreste des their-und Planzenreichs der Vorwelt erlaeutert. Gotha, 437 p.
Taylor, P.D., Vinn, O. and Wilson, M.A. 2010. Evolution of biomineralization in ‘lophophorates’. Special Papers in Palaeontology 84: 317-333. Vinn, O. and Mutvei, H. 2005. Observations on the morphology and affinities of cornulitids from the Ordovician of Anticosti Island and the Silurian of Gotland. Journal of Paleontology 79: 726-737.